This entry was posted in Uncategorized and tagged mkelle, tigrai, tigray, tigray healthbureau by Administrator. Bookmark the permalink. The document date implies the plan was developed for the year 1998-2007(EC). Is there a new plan for the next 10 years? I just don’t see the relevance of this Health Report , 85% of Health problems are water related and twenty five years later , there is no water in the City of Mekelle no matter the excuses . Why don’t who ever is in charge take the demand of clean water as a State of Emergency and give priority to fix the problem . The desperat need of water in Mekelle is not A joke any longer because the city is dirty , the population is dirty and it is a disgrace that has to be given priority and get fixed NOW . Thank you for the comment. There is a 5 Year strategic plan in place going forward. The posted document is meant to summarize the results seen in the past ten years. Thank you for this opportunity, which will help everybody to give feedback to improve health service delivery in Tigray. Tigray health bureau deserves appreciation on being transparent to the wider public and diaspora community. of pregnant mothers in health care facility. 2. so many health care workers at each level. how many doctors are involved in each specific hospital. been there for more than 40 yrs. a public health issue in Ethiopia, I think the NGOs can help in funding some of this. when you compare the budget allocated and actual expenditure. why? including mekelle and many more. the floor, in general not good for infection control. services, to be specific professional competence and facility upgrade. 1. In each of the newly constructed primary hospitals there are 50-75 beds while at general hospitals it varies from 100 to 150 with an average of 6 to 8 doctors. In Ayder hospital there are 500 beds and more than 100 doctors. 2. This report only gives a ten years performance on vaccination hence new vaccines were not included. Both hepatitis B and Rota virus vaccines were rolled out in 2015 gc so currently we are providing ten antigens total. 4. When preparing this report we used the old definition of access to safe water which was estimated by distance (1.5km) to a known safe water source. This is not considering the actual supply of water. The new definition of access to safe water is 500m for GTP 2 and the definitoon of safe water utilization is being supplied 40L per capita per day in urban areas & 20L in rural areas. So according to the new deinition access to safe water will remain high but utilization is estimated around 50%. We will be using the new definitions for access and usage going foward but for the sake of ten year continuity in the report we use the old definition- only accessibility . 5.the maternity waiting room is a temporary solution constructed by the local administration to serve pregnant mothers without transportation access. It is only implemented in remote/mountainous areas. The long term solution is to improve all weather road network. Additionally many of the mothers prefer to sleep on ” medeb ” or a local made mud bed. 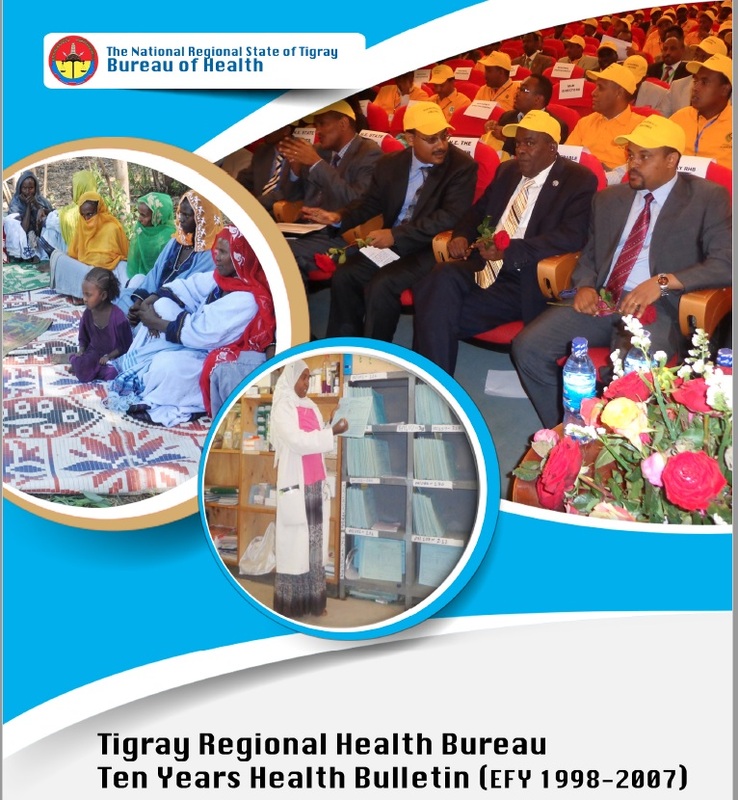 Thanks Tamirat for sharing the bulletin of the Tigray regional health bureau, which reports health indicators for the period between 1998 and 2008 EC. After thoroughly reviewing the report, I felt some of the indicators are too good to be true. The report reveals that 69% of the births in 2007 were attended by skilled professional, which is six times higher than the 10.8% reported in the 2011 Ethiopian demographic health survey. Besides, some indicators are inconsistent to the previous annual reports. For example, for the year 2005 EC, the regional health bureau reported that 50% of deliveries were attended by skilled personnel, while the figures by ministry of health are 44% for the same year. The report further claims that by the end of 2007, 95% of the population in the region had access to safe water supply, while latrine possession and utilization has reached 86%. I am not doubtful about the exemplary work of the regional health bureau and its staff in ensuring access to quality healthcare services across the region. However, these statistics are too doubtful to be true. It’s important to critically scrutinize the reporting system, as data might have been overestimated through the reporting process, without considering the implication of this figures. This is really an astonishing achievement. Kudos to those involved and to the government for such milestone. Such expansion in short time span will undoubtedly cause a strain on maintaining such facilities and staffing them with appropriate health professionals but it is really great to see such stride! Since bulk of the health issues in Tigrai and Ethiopia in general can be prevented by an effective service rendered by a health post worker it is understandable why the effort has been mostly on the expansion of health post. However with the urbanization expansion upon us one wonders if current plan takes in to consideration equally the expansion of primary hospitals. How many of our people do go overseas to get help today because they can’t get help within the country? It would have been also good data material for researchers if the report included actual report of failures at the health center and primary hospital levels. This can help to improve the quality of service and the development of experts . The support politicians and the government are giving to establish a research institute is also a very good idea. Such institute can be a key player in bringing the many expatriate professionals to do meaningful work to help! One hopes when completed the institute will be equipped with modern tools to enable researchers from all over the world to do on time diagnosis of diseases and outbreaks. It seems the institute may have failed to use all budget allocated once! Was this due to capacity or poor execution? If politicians were forthcoming with the budget why was it not used properly? The report should have included a section where all the shortcomings and difficulties were highlighted. That way the next project leader and health worker can be trained for! The report rightly has identified quality and sustainability as the next main focus. Budget allocation to finance quality improvement and to maintain existing facilities will require a tall commitment. One hopes the government will give equal weight to such request the same as its commitment to expansion work! well done Tigray regenal health bureau leaders and all staffs. the health bureau has been doing an outstanding jobs in the health system of the region. This is so great I think others could benefit from learning what you are doing. This is exemplary imitative taken by the Tigray RHB in communicating with wider audience, especially for the diaspora. This is service delivery data, hence some figures may vary when compared to other survey reports. However, from my observation, many of the figures are consistent. As clearly indicated, quality and equity issues shall be the priority issues for the next five years. I think. this demands for more collaborative effort from every concerned body, including the diaspora. I am grateful for Tigray RHB, and I hope everybody will contribute to towards realizing the vibrant vision and strategies set forth by the Government. We all are very proud of the current leadership of the TRHB. They are so vibrant and open for collaboration. They way how the bureau mobilized resources, stakeholders and the community at large is exceptional. That is why they should be cheered for their commendable job. Yet, my grass-root level observation by virtue of my job, is a bit different when it comes to the statistics reported. And, I am certain that the bureau is aware of the wide spread practice of data cooking almost at each hierarchy of the reporting process. My recent visit to 8 woredas proved me that, maternal mortality is highly under-reported. This is because a woreda which reported maternal death is rated poorly by the RHB in its quarterly/annual performance review. I was informed that, officials of the RHB are well informed of such happenings. And the statistics in the current report clearly shows this. Only someone who hasn’t been to Tigray can get convinced with this report which tells 95% of the population had access to safe water supply, and 69% of deliveries are attended by skilled professional. They have enough success stories to celebrate. Intentional reporting of non-existing data should be condemned in the strongest possible way. I share your concern. I think the RHB and FMOH are aware of this issue. in the document, it reads like this: “Allies of the health sector can help to support health research and innovation by volunteering for knowledge and skill transfer, and conducting operational research to inform health policy and interventions.” That means the RHB is calling for more surveys to triangulate the figures. The next EDHS is coming soon, hence it may bring some additional information about the institutional delivery, access to potable water (the role of Water Bureau, while its proper use at HH level being the role of RHB), and other related indicators. Additionally, the Health Transformational Plan (HSTP) has put Information Revolution as one of the 4 top priorities (page 38 in the bulletin). As you said it, under reporting of maternal deaths and discrepancies with the HMIS data reports ate district level has been observed. The Maternal death report, depicted at Figure 10, page 15 shows 217, 146, 122 and 122 in the 4 years period (2003 -207 E.C). If we assume this report is under esteemed by 50%, these figures will be 326, 219, 183 and 183 respectively; which gives 534, 364, 307, and 311 deaths per 100,000 Live Births against the estimated total pregnancies in these 4 years (from 164,000 to 170,000). Again, if further adjusted for different factors using a statistical software, it might give another figure, but still around the national and international published findings for Tigray and for Ethiopia. E.g. 353/100,000 LB, a study by H4, and 266/100,000 a study by Hagos Godefay, published in Journal of global health 2015. However, al these figures are unacceptably high! That is why the FMOH targeted for 199/100,000 by 2020 in the HSTP, still high, which is still 200 folds when compared to the figures from Scandinavian countries. Thanks God, and the joint efforts of the professionals, community, government and development partners, it is now halved form the 400 folds some 15 years back.